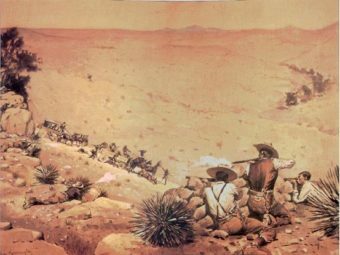 The story behind what came to be known as the Wham Paymaster robbery began on the morning of May 11, 1889 when a U.S. Army paymaster called Major Joseph Washington Wham was charged with transporting a lockbox containing the salaries of several hundred soldiers across the Arizona desert from Fort Grant to Fort Thomas located some 50 miles away. All in all the lockbox contained $28,345.10 in gold and silver coins worth the equivalent of about $784,000 today. Tasked with protecting the contents of the lockbox, Paymaster Wham’s convoy included 9 Buffalo Soldiers of the 24th Infantry and two privates of the 10th Cavalry. At this point it’s probably worth mentioning for anyone unfamiliar with the term “Buffalo Soldiers” that all of the soldiers protecting Wham and his convoy were black. Whatever the case, during the ensuing 30 minute firefight, 8 of the soldiers guarding the convoy were shot, two of them multiple times. Of note are the actions of one Sergeant Benjamin Brown who shrugged off a bullet wound to the gut to stand out in the open firing at the bandits with his trusty revolver. After being shot twice more (once through each arm), a fellow soldier braved the bullets to carry Brown to safety. Unwilling to halt his one-man assault, Brown continued firing on the bandits while being carried away. Another Buffalo Soldier, Corporal Isaiah Mayes, similarly ignored the hailstorm of bullets, two of which hit him in the legs, to quite literally at times crawl to get help two miles away at a nearby ranch. Unfortunately, with nearly everyone in the convoy seriously injured, they were forced to retreat away from the wagons, at which point heavy gun fire kept them pinned down while some of the bandits ran in, used an axe to open the lockbox, and stole the contents. Because of their uncanny bravery and dedication to protecting government property with their own lives, Wham immediately recommend 9 of the Buffalo soldiers for the Medal of Honor. Both Brown and Mayes were subsequently awarded that medal, while 8 other soldiers Wham singled out for their bravery were instead awarded certificates of merit. As for the money, nobody is exactly sure what happened to it because nobody was ever convicted of the crime in question, despite that many among the robbers were recognized during the gunfight as they brazenly did not wear masks. It’s speculated that they didn’t bother with masks because they felt morally justified in the robbery and were all upstanding, church-going members of a nearby town, Pima, with the robbery seemingly organized by the mayor himself, Gilbert Webb. Webb had come on hard times and was on the verge of bankruptcy. As he was a major employer in the town, and the town itself had come on hard times, he seems to have gotten the bright idea to simply take the money from the U.S. government to solve his and the town’s problems. As to why he and others in the extremely religious town thought this was a perfectly moral thing to do, well, the town was largely made up of Mormons who felt very strongly (and not really unjustified in this case) that the U.S. government had been oppressing them for years, and so taking money from Uncle Sam was no real crime. And so it was that when seven suspected members of the robbers were tried for the robbery, community members were seemingly stepping over themselves to give them an alibi (with 165 witnesses testifying in all). On top of that, the original judge, William H. Barnes, had to be removed from the case when it was discovered he was not only a friend of one of the accused, but also was actively intimidating witnesses for the prosecution. This all ultimately resulted in U.S. President Benjamin Harrison himself stepping in and appointing a new judge, Richard E. Sloan. In the years that have passed since the famed robbery, numerous legends have arisen about where exactly the money ended up, including several that posit that the money is still buried somewhere out there in the Arizona desert. However, given none of those who committed the robbery were convicted and it would seem much of the money was used by Mayor Webb to pay off debts around town, as well as forgive the debts of some of the men who helped him in the robbery, this seems extremely unlikely.